A grassroots movement has recently emerged in which a number of scientists, philosophers, ethicists and legal experts have rallied together in support of the idea that some nonhuman animals are persons and thus deserving of human-like legal protections. Their efforts have subsequently thrown conventional notions of personhood into question by suggesting that humans aren't the only persons on the planet. So what is a person, exactly? We spoke to two experts to find out. To help with the discussion, we spoke to Lori Marino, Senior Lecturer in Neuroscience at Emory University and the Science Director for the Nonhuman Rights Project (not to be confused with the IEET's Rights of the Nonhuman Persons Program, of which I am the founder and Chair), and John Shook, a Research Associate in Philosophy and faculty member of the Science and the Public EdM online program at the University at Buffalo. As we learned through our conversations with them, it may be some time before we reach consensus on what truly constitutes a person, but it's becoming increasingly clear that many nonhuman animals are smarter and more aware than previously thought — what will certainly upset our notions of their legal and moral standing. Lori Marino, through her efforts with the NhRP, is trying to secure legal protections for a special subset of nonhuman species, a list of highly sapient animals that includes all the great apes (like bonobos and chimpanzees), elephants, cetaceans (which includes both dolphins and whales), and even some birds. And the legal protections that Marino is talking about are not your run-of-the-mill animal welfare laws. Rather, they would be the same set of laws that protect any person — humans included. 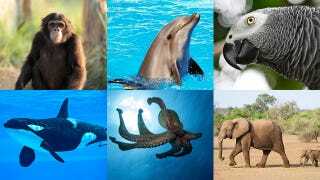 If and when these laws get passed, nonhuman persons would be protected from such things as torture, experimentation, slavery, confinement (including zoos and water parks), and the threat of unnatural death (like hunting and outright murder). Essentially, if you wouldn't do it to a human, you wouldn't do it to a nonhuman person. All this being said, it may seem odd to refer to nonhuman animals as persons. "It seems strange because we are so used to thinking of persons as equivalent to human and limited to humans," Marino told io9. "But being ‘human' is what describes us as a biological species. Being a person, on the other hand, describes us as the kind of beings that we are." But not everyone is on board the idea. Critics like John Shook argue that the effort to grant nonhuman animals personhood status is both misguided and unnecessary. As a supporter of animal rights in general, he believes there's a better way. "It is quite reasonable to protect nonhuman species from unnecessary pain and cruelty at our hands," Shook told io9. "Laws preventing such mistreatment extend protection rights, and such legal rights are 'equal' rights in the sense that persons should be protected like that as well." Assigning personhood isn't necessary for establishing protection rights, he argues, just compassion. "Furthermore, trying to justify assigning personhood to nonhumans runs into obstacles erected by scientific fact and a little logic, not deep philosophy," he says. But that said, these philosophical notions are starting to be challenged by scientists. Earlier this year, a group of prominent scientists signed the Cambridge Declaration on Consciousness in which they proclaimed their support for the idea that many animals are conscious and aware to the degree that humans are. The rest of society, they said, need to take note and behave accordingly. Indeed, Marino and others are increasingly using science to demonstrate that personhood is not merely about an animal's ability to participate in the social contract, but rather something that's predicated on the sophistication of their cognitive capacities. It's this very idea that drives Marino in her work. "I came aboard the NhRP as the Science Director for a very good reason," she told us, "there is an abundance of evidence to support the effort for legal personhood for nonhuman beings. And, I sincerely believe that other animals need to have personhood status in the law if things are to change for them in any real substantive way." To that end, Marino has also supported other efforts like signing the Declaration of Rights for Cetaceans: Whales and Dolphins at the American Association for the Advancement of Science earlier this year. Marino says that philosophical notions of personhood are fine, but in order for the basic rights of nonhuman beings to be truly protected they have to be given legal status as persons. "As it stands, no nonhuman being has that legal status — they're all considered property," she says, "And, although there are animal cruelty laws, they are human-oriented rather than focused on the real victims of cruelty – the nonhuman beings." Moreover, she says that designating some nonhuman animals as persons will do much to change the public's mindset about other animals. "Just as legal personhood status led to a change in how African slaves were viewed and, eventually, to their status as free individuals, I think the same will happen with other animals," says Marino. "I believe that animal rights is the new frontier in the domain of rights. Just as with human slavery, in the future we will look back on how we've treated other animals and will be deeply ashamed." An immediate challenge for animal personhood advocates is to formally define what they mean by a person — not an easy task. We humans automatically get to be called persons, and as a result, we've never really had to come up with formal definitions. Even the abortion debate hasn't settled the issue; ‘personhood' is typically invoked when a fetus is viable outside the womb — not a very helpful guideline. What is changing, however, is the notion that personhood is not something that one is simply born into by virtue of their species, or something that's dependant on one's level of sociopolitical engagement. Rather, it's something that comes about by virtue of the presence of certain cognitive psychological, and emotional capacities. One of the better attempts to define a person came from the bioethicist Joseph Fletcher who presented a list of fifteen "positive propositions." His attributes included such things as self-awareness, self-control, a minimum level of intelligence, a sense of time (including a sense of the past and future), concern for others, curiosity, and so on. Fletcher's list did not come without controversy. By virtue of his criteria, a person in a permanently vegetative state and with no brain activity would not be considered a person. And at the same time, certain nonhuman animals would have to be considered persons. Put another way, Fletcher's list meant that not all humans are persons, and not all persons are humans. The subsequent challenge facing scientists and bioethcists has been in proving that nonhuman animals have these capacities. But as the signatories of the Cambridge Declaration conceded, there is a tremendous amount of data emerging in support of the idea that animals are conscious to the degree that humans are. "Convergent evidence indicates that non-human animals have the neuroanatomical, neurochemical, and neurophysiological substrates of conscious states along with the capacity to exhibit intentional behaviors," they wrote in the Declaration. Shook, on the other hand, takes great exception to the idea that personhood can be defined by ticking off a checklist of criteria. "First, let's at least assume that assigning personhood to all species in the animal kingdom is not optimal," he says "Therefore, some criteria must be chosen which has both these properties: (a) these criteria select out only those "higher" species that seem sensible (for example, the criteria forbids insects but includes birds; or forbids birds but includes aardvarks; or forbids aardvarks but includes lions), and also (b) every human being possesses all these criteria — after all, its not a good result to leave some humans out of personhood." "Biting the bullet here and saying that only a subset of humans are really persons so that horses or foxes can be persons will arouse far more controversy than protecting animals from cruelty," he says. "Have animal rights activists intrigued by personhood yet agreed on exactly when a human fetus becomes a person in the womb, or perhaps their criteria for personhood suggest that the line is drawn six months after birth? At this stage, it instead seems wiser to think about how to use new science about sentience and suffering to arouse human compassion for many other species than to risk limiting personhood to fewer humans." Marino, on the other hand, is not convinced that paternalistic rights will suffice. Moreover, her personal definition of personhood is far less strict than that that of Fletcher's and other personhood theorists. "My definition of personhood is very practical and very context driven," she says, "I don't see this as a black and white issue — it is more of an issue of bringing the existing evidence to bear on the efforts." She agrees that there is an overwhelming amount of scientific evidence indicating that many other species, such as cetaceans, elephants, great apes, and some birds, share those basic characteristics that define personhood in our own species. But she takes it even further than that. "On a personal level, I view all other animals with a brain as persons, she says. "They are not human but they are other persons. But regarding the NhRP we are letting the science lead our legal definition." Marino doesn't believe that there is a clear-cut line in nature that differentiates conscious from nonconscious animals. "From a neuroanatomical point of view it is reasonable to accept the premise that all animals with a central nervous system are conscious," she says. "This is what brains do for a living — they provide a way for the animal to process information and respond appropriately, and that's true whether you are an aplysia or a chimpanzee." She concedes that the empirical evidence tells us there are differences across species. "Some readily recognize themselves in mirrors, for instance, and others just don't get it," she says. But when we look at the complete set of data in the literature, she argues, it demonstrates that consciousness is a dimensional phenomenon. "Some animals may be capable of more complex and profound levels of awareness than others," she says, "But all are conscious." Images: Shutterstock/Rahmo/Villiers Steyn/FineShine/VogueHouse/Vittorio Bruno/Ivan Cholakov/Miles Away Photography. NP/DOMINIQUE FAGET/AFP/Getty Images, AWF.